Witches have had many misconceptions throughout the years... one of the most heinous ones being that they were evil and deserved hanging or burning. 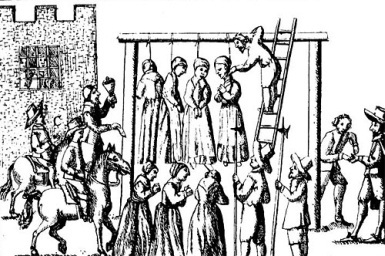 Witch trials in both Europe and the colonies which would become the United States took place between the fifteenth and seventeenth centuries because of the perceived threat against Christianity. Mass fear and negative images were used to further other agendas... which led to violence against people who were not even practicing what they were accused of. For centuries, Christianity has turned to the Bible to condemn witchcraft. Both Exodus and Deuteronomy have passages alluding to God's displeasure with witches or "sorcerers". An example often used would be that of King Saul and his visit to a necromancer (one who can speak with the dead) for assistance in communicating with the soul of the prophet Samuel. She was known as the "Witch of Endor". Saul succeeded, although he was told by Samuel that God was displeased because Saul had sought council from the dead rather than trust in God Himself. Many interpret this as God speaking against any means of communicating with the dead. Yet, in looking at the Ancient Egyptians, Greeks, and Romans, whose writings pre-date that of the Bible, the perception is quite different. It shows that anyone who was blessed by the gods and goddesses was admired rather than reviled. Their powers were believed to include shapeshifting, visions, and the ability to create potions and elixirs that had the ability to change physical appearance and emotional outcomes. It was believed that the ones who were blessed with these gifts could use them for positive or negative... therefore anyone having these powers was respected. 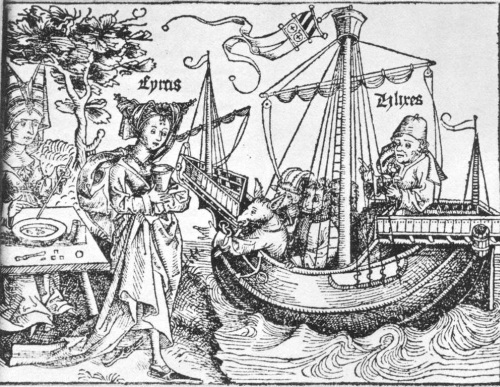 One notable written example was Homer's "Odyssey" with Odysseus arriving on the island where the sea nymph Circe lived... the woman who cast a spell on his crew, turning many of them into swine. It was only through Odysseus gaining access to a specific root from the god Hermes that her magic was destroyed. In the code written by King Hammurabi of ancient Babylon (dated to 1750 BC) that still exists, there are references to casting spells... only speaking against using it against somebody unjustifiably. The craft itself is ancient... but the misconceptions and myths began when monotheistic religions (such as Christianity) needed to gain mass control. Where did the term "witch" even come from? In looking at the etymology, or the word's history, there is the Old English "wicce" (sorcerer). Looking beyond that into the Indo European and Germanic origins, there are many theories. There are words such as "weik"(to bend or fold) and "weid"(to see or to know) that have supernatural connotations believed to have been translated into the Old English... and then to the Modern English with the word "witch". What it boils down to is the word itself has been taken from several words and meanings to label those who had abilities that were beyond what was considered the norm. In layman's terms however, a "witch" is a person who practices witchcraft... a combination of ancient beliefs of the Greek, Roman, and Egyptian gods and goddesses, as well as collections around the world of old practices. In these accounts, the religion of the Earth was the most ancient of all, and where all future religions would be born from. Each witch is different, depending on what area of the world they are from. There are many names that basically translate to the same thing... someone who has extensive knowledge and abilities that include alchemy (chemistry involving the change of one object into another), shapeshifting, knowledge in herbs and natural remedies, and of course... casting "spells" or incantations to focus something into being. This could of course be done for either negative or positive... but in nearly every account, there is a price to be paid for using any ability for harming someone or for personal gain alone. Throughout the years, many myths have been encouraged about witches being evil and in some cases, not even human. When monotheism (belief in only one God) was in its beginnings, many of the people were unwilling to simply walk away from the ancient beliefs they had known for generations. The blanket term of "pagan" (which actually means 'country dweller') was coined to describe anyone who did not subscribe to acknowledging only one God. This included people believed to be witches. Tales began to be told of these "creatures of Satan", usually female, who would make pacts with the Devil to live a life of sorcery and magic... and in service to him. As time went on, even more mythologies were mixed in to justify a fear of witches. 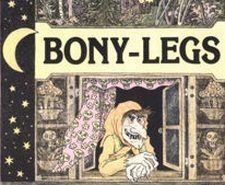 The image of the "fearsome creature" was inspired largely by the Eastern European legend of Baba Yaga, or "bony legs". Baba Yaga was usually portrayed as a gruesome hag of a woman who lived in a small hut supported by chicken legs. In most cases, she is a force to be reckoned with. The image of the crooked shaped old woman on a broomstick was a misinterpretation of those practicing ritual magic and continuing the tradition of "night traveling". This practice has roots in many nationalities, and is based on those who astrally projected themselves to travel with the gods and goddesses. There was certainly no evil connotation to it, and they were not doing the "devil's work". That particular myth was encouraged by those who had other agendas... more specifically, the early leaders of Christianity. Of all the wrongs done in the name of God... the mass hysteria of the "evils of witches" that took place in the Middle Ages throughout Europe and colonial America is among the worst. In an effort to sway public opinion to support the Church in all ways... these myths of witches being evil and Satanic were fostered by these leaders. One piece of writing in particular called "Malleus Maleficarum (from the Latin "Hammer of the Witches'), published in 1487, stands out as a form of literature that incited people to fear witches and try them as criminals. Malleus Maleficarum was written by a man named Heinrich Kramer, who at the time was an Inquisitor for the Catholic Church. His work is not the first of its kind, as much of it is inspired by the writings of Johannes Nider in "Formicarius". It encouraged the belief of witches being evil and nearly always female, gave a list of different forms of witchcraft (which basically meant anything that wasn't Christian), and most horrendous of all... urged anyone reading to grab up a torch and hunt down a witch... for the good of God. It worked... witch trials occurred in Europe in the fifteenth and sixteenth centuries, with a strong rise in both Europe and Colonial America in the seventeenth century. It led to countless deaths of mostly women (although men were not exempt) by means of burning, hanging, and stoning. Ridiculous tests were given... such as a woman being tied with a stone and thrown in the river... if she came back up, she was a witch and killed on the spot. If she didn't... well, she was innocent... but a lot of good it did her now! Witches today are sometimes mistakenly thought to be strictly with the Wiccan religion begun by Gerald Gardner in the 1950's. However, not all witches are Wiccan... many do not feel bound to any religion at all. "Pagan" is the word that was given to them... they have in turn reclaimed it for their own and use it proudly, as well as the word "witch". While there are those, as with any walk of life, that use the craft itself for personal gain and negative repercussions... many simply want to live in harmony with nature and the elements. They use whatever particular gift or ability they have honed for the greater good. They celebrate the Earth and its bounty, and honor the seasons and solstices. They live, love, marry, have children, have hopes and dreams. They are not afraid to defend what they hold dear, and they worship as they see fit. Nothing to be afraid of... with the exception of ANY continued perpetuation of the myths. Our white ladies leather bomber jacket and best trench coat with hood provide a real star look to discount classic designer leather pants. Beside this we carry a wide variety of cute tight leather pants for women and used dirt bike gear sale.